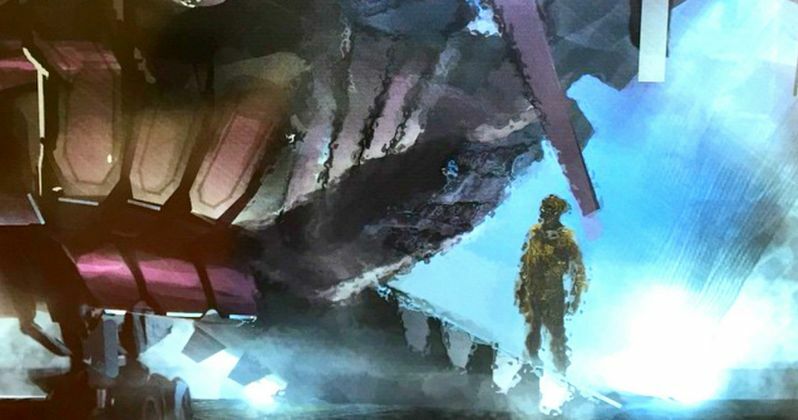 Following the 1983 Cerebro photo released earlier this month, X-Men: Apocalypse director Bryan Singer took to his Instagram account earlier today to reveal new production artwork from his highly-anticipated sequel, which begins shooting this April in Montreal. While the subject of this artwork has yet to be confirmed, it is believed to depict the alien spacecraft discovered by a young En Sabbah Nur (a.k.a. Apocalypse) in ancient Egypt. You may recall that the end credit sequence of last year's X-Men: Days of Future Past featured En Sabbah Hur using his mutant abilities to construct the pyramids in Egypt. Dubbed "Ship" in the comics, this spacecraft served as En Sabbah Nur's base of operations for several years, and even housed the X-Men themselves at one point. The ship also has ties to the X-Force character Cable. It's possible that there may be a connection between X-Men: Apocalypse and the upcoming X-Force adaptation, which doesn't have a release date set at this time. Oscar Isaac is playing the villainous Apocalypse, with Alexandra Shipp (Storm), Sophie Turner (Jean Grey) and Tye Sheridan (Cyclops) recently joining the cast as well. X-Men: Days of Future Past stars James McAvoy (Professor X), Michael Fassbender (Magneto), Jennifer Lawrence (Mystique) and Nicholas Hoult (Beast) are expected to return, alongside X-Men: First Class star Rose Byrne (Moira McTaggert). Take a look at the artwork below, and stay tuned for more images and details regarding X-Men: Apocalypse. "Some production art. #XmenApocalypse #GrantMajor I was a little busy but will continue to snap more."